I build 1/72 U.S. and Soviet Aircraft – post WW II. 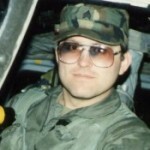 I served in the US Air Force (1977 – 1981), stationed at F.E. Warren A.F.B., Cheyenne, Wyoming. Returned to Iowa and joined the Iowa National Guard 1/194 Air Cav. (1981 – 1994).